when the survey should take place (anything between Monday and Sunday for the weekly Pulse and day 1 to day 28 for the monthly Pulse is possible). The system will show you your current settings in the "General Settings" box on the right. Remember to save these settings! In the "Questions" section, you can see the entire list of Pulse questions (roughly 120 in total) and can decide to deactivate any questions that shouldn't be asked at all by clicking on the green button on the right of the question. If you click on "Preview", you will see the questions which have been selected for the current cycle. In the last section, "Recipients", you choose who should take part in the survey. 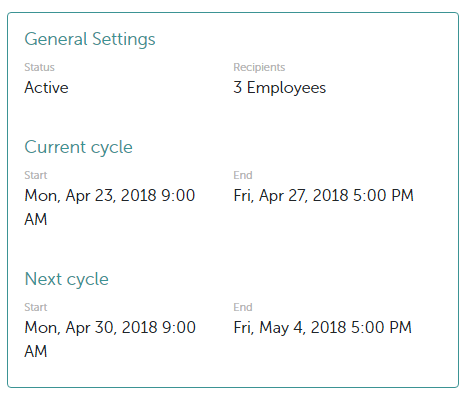 You can add either groups or individual employees. Remember to save these changes too! Click here to learn how to add employees. This may also interest you: How do I create my own surveys?